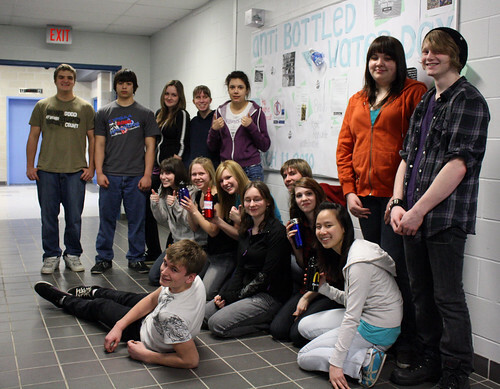 A group of students at Dryden High School are helping to promote Canada’s first “Bottled Water Free” day. On March 11, 2010, students are asked to support the cause by not bringing single use water bottles to school, or purchasing them in the school. Students in Mr Darling’s SVN 3M Environmental Science class are instituting a “Block A Challenge”. The Block A Challenge will consist of a count of students who are doing their part to help the environment by using re-fillable drink containers. This will take place on Thursday, March 11. The purpose of bottled water free day is to spread environmental consciousness about the waste problem that single use water bottles create. For more information on this campaign, please click here to visit Bottled Water Free Day.